has played many roles during his career and has received enthusiastic acclaim from audiences and critics alike. Below, find his biography and some of the many national and international reviews of his performances. Also, a special video for you to enjoy, featuring the aria "La Vendetta" from Le Nozze di Figaro at the Royal Opera House Covent Garden. 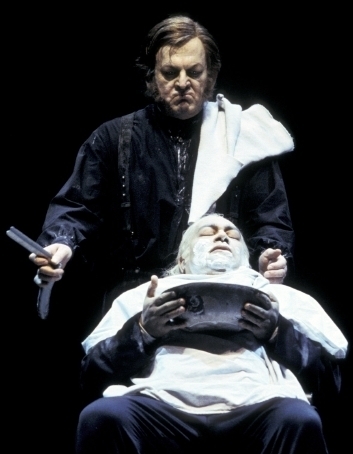 Jonathan plays the role of Bartolo, for which he received warm critical acclaim. Jonathan Veira’s extensive repertoire over 25 years includes Don Alfonso Così fan tutte, Leporello Don Giovanni, Papageno The Magic Flute,the Count, Dr Bartolo & Antonio Le nozze di Figaro, Don Magnifico La cenerentola, Dr Bartolo Il barbiere di Siviglia, Mustafa L’Italiana in Algeri, Falstaff, Fra Melitone La forza del destino, Dulcamara L’elisir d’amore,Don Pasquale, Tonio Pagliacci, Schaunard La Bohème (Leoncavallo), Sharpless Madama Butterfly,the Bonze madama Butterfly ,Scarpia Tosca,the Sacristan Tosca, Don Alvaro La vedova scaltra, Buonafede Il mondo della luna (Haydn), Harasta The Cunning Little Vixen, Kolenatý The Makropulos Case, Dikoi Kat’a Kabanova, The Foreman Jenůfa, Keçal The Bartered Bride, Claggart Billy Budd, Hobson Peter Grimes,Bottom Midsummer night's dream,Quince midsummer night's dream, Varlaam Boris Godunov, Calchas La Belle Hélène, Baron Mirko Zeta The Merry Widow, The Doctor Vanessa, Merlin New Year, and The Judge Sweeney Todd. Among the conductors he has worked with are David Atherton, Sir Andrew Davis, Sir John Eliot Gardiner, Sir Bernard Haitink, Nikolaus Harnoncourt, Vladimir Jurowsky, Jirí Kout, Jon Marin, Antonio Pappano, Christian Baddea,Steven Barlow and Michael Schønwandt amoung many others. Jonathan Veira has appeared regularly at the Royal Opera House Covent Garden, English National Opera and Glyndebourne Festival. His international engagements have taken him to the Opera de Lyon, Opernhaus Zürich, Grand Théâtre de Genève, Royal Danish Opera, Opernhaus Leipzig, Norwegian National Opera,the Royal swedish opera the Opéra du Rhin, Opera New Zealand, and the opera companies of Montpellier, Nice ,Aix-en-provence,Caen,Lille,Amias and limoges. In the United Kingdom Jonathan Veira has also appeared with Scottish Opera and Welsh National Opera. As a concert artist Jonathan Veira has performed in major venues including many engagements for the BBC Promenade Concerts at the Royal Albert Hall. Jonathan Veira was a featured artist in the Lehnhoff Janacek cycle at Opéra de Lyon in the roles of Dr Kolenatý The Makropulos Case, Dikoi Kat’a Kabanova, and The Foreman Jenůfa. Television appearances include: Le Nozze di figaro(ROH);Death in Venice(GFO);Madama Butterfly(ROH);Marriage of Figaro(channel 4);Zoe (Glyndebourne in conjuction with channel 4)amongst others. He has frequently appeared on BBC 1 for over 21 years on Songs of Praise and a variety of religious programmes. Nearly all of the above operas have been aired on Radio 3 and various national European radio stations. Jonathan has also made frequent appearances on BBC radio 2's Friday Night is Music Night. In addition Jonathan broadcast regularly over many years for the live BBC Proms. Recordings include: Le nozze di Figaro(Chandos); Jenufa(ROH); Lulu (GFO); Betrothal in a Monastery(GFO); La vedova Scaltra(Montpelier); Rose of Persia The spanish lady(BBC); Opera Rara collection of Bel canto style(Philharmonia);A century of english song(Somm); Of fire and dew,the songs of John Jefferys (Somm);Idylls and Elegies With the philharmonia:more of john jefferys(divine art); Fogotten memories;a collection of Edwardian and Victorian parlour songs with Shelley Katz Piano. Jonathan has also recorded six solo CDs and a DVD of his one man show on the elevation label with a mixture of popular and Gospel songs; details on the shop page. Jonathan recently sang the role of Don magnifico to great critical acclaim for GTO(see reviews). His future plans include Mustfa for opera Opera limoges and in Aix-en-provence,quince ,midsummer night's dream (ENO) and the title role of the new glyndebourne production of Don Pasquale. Reviews of JV in Boris Godonov as Varlaam - E.N.O. Veira is also masterly with his icy and heavy authority. After a lot of excellent comedy roles it is very exciting meeting his great musical and dramatic talent in Claggert's demonic figure, who's imposing danger only Billy Budd can overlook. From his first imposing entrée up the stairs from below deck with a lurking glance he has the stage in his power, and treating the text sharp as a snake he stretches his beautiful voice to powerful dominant heights. Veira is the poison personified, as the, disturbed & envious Claggert. He has to destroy happiness and joy. …and Veira sings the Master of Arms Claggert gloriously and has a formidable stage presence in his strong hatred to the Navy's upper-class officers. Impressing is Jonathan Veira as the villain Claggert. Dark and devilishly-slow walking across the stage he spots and corners his victim merciless. Billy Budd's evil opponent Claggert was played to the line, but never crossing it by the harmonious singing of Jonathan Veira. Britten has given him a credo of evil similar to Jago in Othello, adding to the figure an extra edge of psychological mystery. Veira's Claggert is ironic and demon like and there are many fine moments. A fine detail is the way Veira portrays Claggert, touching deeply and underlining that there is still a little part left of humanity underneath the rock hard surface. It is though the English veteran Jonathan Veira as Claggert, who steals big parts of the performance, is able to show how the evil hurts the monster as well. The baritone Jonathan Veira sings and acts the dark and unpleasant Claggert or outstandingly. 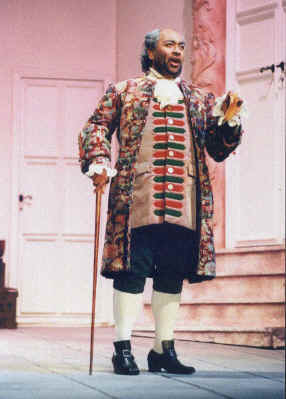 Don Pasquale trying to marry off Ernesto, his nephew, who flatly refuses. So Pasquale says he will marry her instead- That's Opera for you!